Disclaimer: I did not receive free product in exchange for this review nor was I asked to write a review by this company. These opinions are my own. A few weeks ago I was shopping at By Nature in search of a few...things...okay I was there looking at diapers. Sue me. I was chatting with one of the ladies about needing a new CD safe diaper cream. She ran through the options that the store carried and pointed out that one of the companies had changed their labeling and they were clearing out the old at discounted prices. While the diaper cream wasn't on sale a similar product, also safe for CD and more importantly Emmett's bum, was. I purchased Soothing Skin Ointment and Shea Butter Cream that fateful day. Fell in love and then added to my collection. This great product you ask? 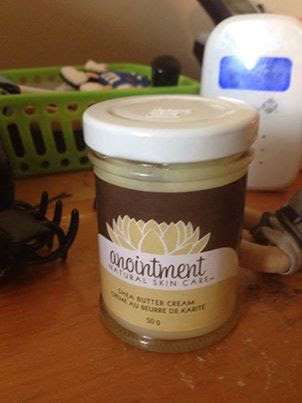 Anointment Natural Skin Care. Things I love? Canadian made! From the East Coast in New Brunswick these products are made by hand. Certified organic materials that are hand grown. Natural and safe. I sent off a quick comment to the shop owner, April, telling her that I loved the product! She sent a very friendly return with some super helpful tips! 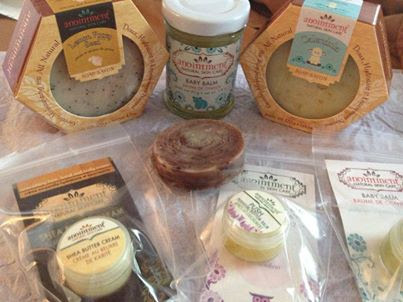 Since them my product stash has grown to include a number of her handcrafted, natural soaps (for me and Emmett), Baby Balm and lip balm. My order plus a few goodies she included! Om Shanti smells divine. I was hesitant to order it because I often don't like the "fake" smell of coffee and chocolate in products. Not the case. Included in my order was a sample bar of this amazing, signature scent. I have since purchased a full bar from a local vendor! I love that you get a gentle exfoliation with each wash too! Lemon Poppyseed smells good enough to eat. I was worried after my first shower that as with most bar soaps I could feel my skin tightening and drying out - this lasted briefly and then my skin felt silky smooth! Craig said my legs felt like they were freshly shaved...and I assure you they were not! I also purchased Baby Calendula for Emmett. It is mild, unscented (although I'm convinced I can smell a natural flower garden - which is lovely). It leaves his skin feeling so soft. Skin Soothing Ointment worked great on the mosquito bites I brought home with me from Haliburton a few weeks ago! I barely suffered from any uncomfortable itch and the bites cleared up much quicker than usual! The ultimate test will be next weekend when we take Emmett camping for the first time! I like knowing that I have a natural remedy to tote along! I know I will be a long time customer of this great company and I can't wait to cross of the "must tries" on my list! I highly recommend checking out the companies website and getting yourself some of these wonderful products! Or check out By Nature in Orillia who are a local retailer! If I could give them 6 stars...oh wait, I can it's my blog!! Lets call it a 5+ Star!